Space Shuttle Columbia's payload doors close around the Chandra X-ray Observatory. In this historical photo from the U.S. space agency, on July 17, 1999, the Space Shuttle Columbia's payload bay doors close around the Chandra X-ray Observatory inside, while workers monitor the activity at Launch Pad 39B. 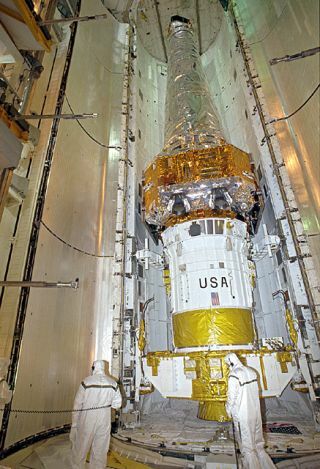 Chandra is the primary payload on mission STS-93, scheduled to launch aboard Columbia July 20 at 12:36 a.m. EDT. The combined Chandra/Inertial Upper Stage, seen here, measures 57 feet long and weighs 50,162 pounds. Fully deployed with solar arrays extended, the observatory measures 45.3 feet long and 64 feet wide. The world's most powerful X-ray telescope, Chandra will allow scientists from around the world to see previously invisible black holes and high-temperature gas clouds, giving the observatory the potential to rewrite the books on the structure and evolution of our universe.